Because spending last week commenting on hate groups and the fine line between protecting the peace and abusing one’s power was just a little too simple (pfft), AoS spends this one debating the nature of time, determinism, and the limitations of (In)human perspective. The results are mixed thanks to some rushed, transparent plot-moving coincidences, but I’ll give ’em full marks for effort, at least. Team SHIELD follows a distress call to a doomed man with visions of his own death, which leads them to Inhuman Charles Hinton (Bjørn Johnson) who invokes said visions (for both himself and the person he touches). Hydra scoops him up, but not before Daisy grabs his hand and gets a cold splash of Future straight to the face: Attacking agents, Coulson shooting her, and watching Charles die. Convinced she’s been personally chosen to save Charles, Daisy insists on going on the mission, but local ScienceBummer Fitz subscribes to a static interpretation of time and says that’s not possible. 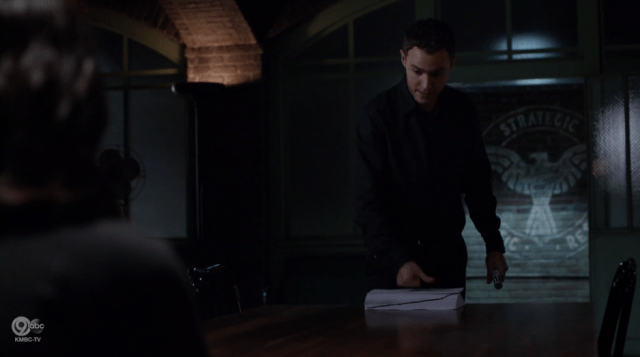 AoS will go on to challenge this, suggesting that Fitz’s worldview tells us more about himself—and his sense of helplessness at recent events—than it does about the nature of time within the MCU itself. 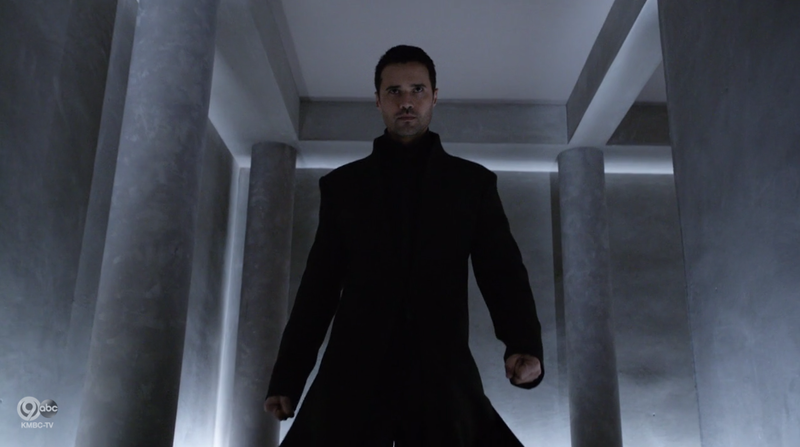 Elsewhere, Team Hydra visits Transia, a tech company that specializes in prosthetics and exoskeletal limb assistance (like Coulson’s hand because #ItsAllConnected) so that Yeerk!Ward can give Malick a taste of “true power.” He also gets a douchey Matrix coat, increasing his Face Punchability by approximately 200%. Welp, now there’s a smudge on my computer from where I tried to smack him. In an attempt to change the future, Coulson plans to send May on the mission instead of Daisy, but The Great Will of the Macrocosm shall not be denied, so the writers have Andrew surrender himself to SHIELD because he wants to see May one last time before Lash takes over completely (and also because SHIELD will eventually need to point Lash like a cannon at Yeerk!Ward and have them go at it in an epic final fight that will cost roughly all of the budgets). … but even so, having Andrew just conveniently show up at the base is quite the stretch, not to mention turns the May/Simmons story line from last week into a big ol’ waste of time. If you need Daisy to Fulfill The Prophecy, then why not have Simmons pinpoint Andrew’s location near a major city and May has to go find him now before he kills someone else, and then he surrenders to her? At least that would come naturally out of the information that came before it. Like much of the Andrew/Lash story line, attempts to surprise the audience with sudden “twists” mean that too much occurs off-screen, making the whole thing feel rushed and as if events happen because the writers need them to happen for Plot rather than occurring organically due to character-motivated action. 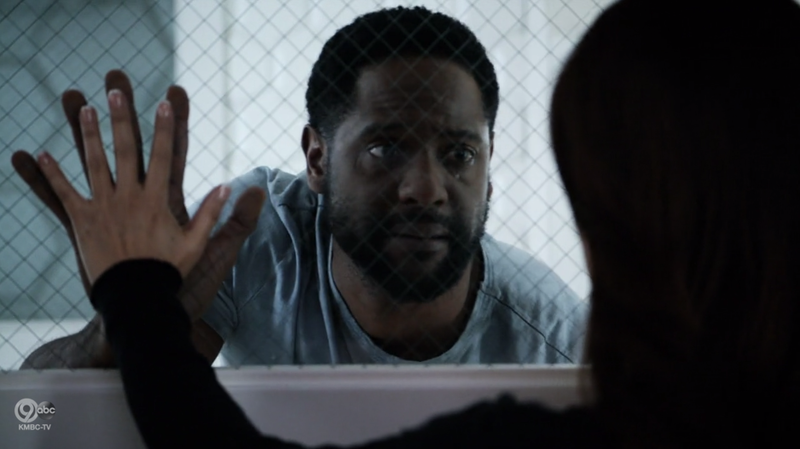 Fortunately, Ming-Na Wen and Blair Underwood are talented actors with good chemistry, so even though the events that lead to this farewell is rull contrived, their scenes still manage to resonate because, UGH, I just want them to be happy and they are so very, very doomed. While Andrew says goodbye (sniff), Daisy flies solo into Transia, a plan that quickly changes when the rest of the team spots Ward(‘s body) sauntering around on the security cameras. Coulson and Lincoln join the fracas and things start to go down just the way Daisy interpreted, albeit with some key differences (like Coulson shooting a mirror). Eventually she gets to the roof, where a power-drunk Malick tries to stop her with his nifty new Ironman Arms, and—surprise! the death she saw wasn’t Charles’s! It was her own! Proving that sometimes the future can be changed, Charles zaps Malick with a future-vision of his own (probably his own death given how rattled he is afterwards), giving Daisy time to fling him into a wall and force him to retreat. Relieved to have finally “made a difference,” Charles asks Daisy to look after his daughter just in case she turns out to be Inhuman, too. The two share a prophetic fist-bump, flashing forward to that blood-splattered spaceship and floating cross from the mid-season premiere. 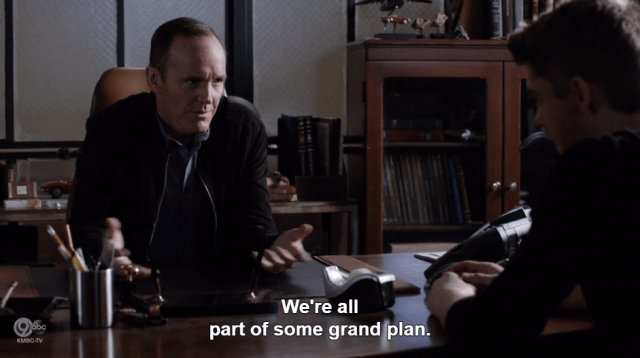 Agents of SHIELD dot PNG. Prophecy stories are tricky, because you have to find ways to surprise the audience without events feeling too convenient or veering too far off-course from the initial vision. While I had some issues with the way AoS played things out this week (see critique above), I appreciate the intent, and I like what this episode did in terms of discussing power and human limitation, particularly in regards to Daisy’s character arc. As with the mirrored conversations about “the greater good” (sorry!) 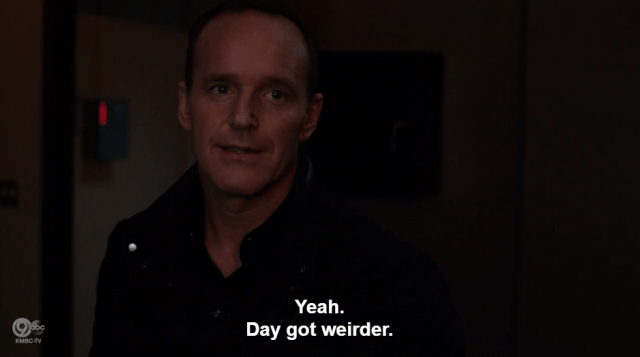 between Coulson and Malick, Daisy and Yeerk!Ward both talk about “power” a lot this week—and Malick specifically talks about its intoxicating effects, particularly when used to directly and deliberately take power away from somebody else. 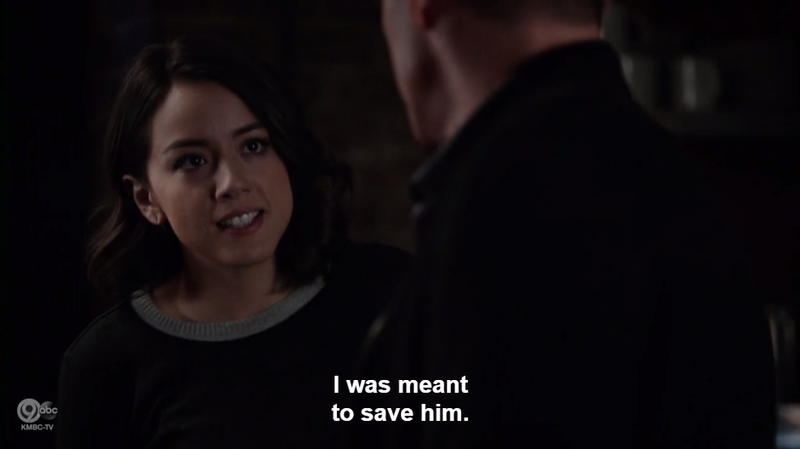 Coulson felt that power when he killed Ward and it freaked him out so bad he had to ditch the hand that wielded it; Daisy felt it last week when she shook down extremists and kinda loved it, leading to her attempt this week to use that power to change the future itself. What AoS does really well here is show the limitations of individual perspective. (This ties a bit into the episode’s pop-philosophical musings on time as well, given subjective perception ‘n’ all.) On the more personal side, Daisy keeps encountering firsthand experiences that challenge her view of Inhumanity as a “birthright” and gift everyone should accept, this time with Charles’s family and Andrew’s tenuous grasp on his own sense of self. 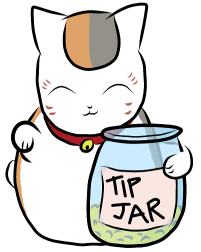 And, on the professional side, she misinterprets her visions in some small but vital ways. 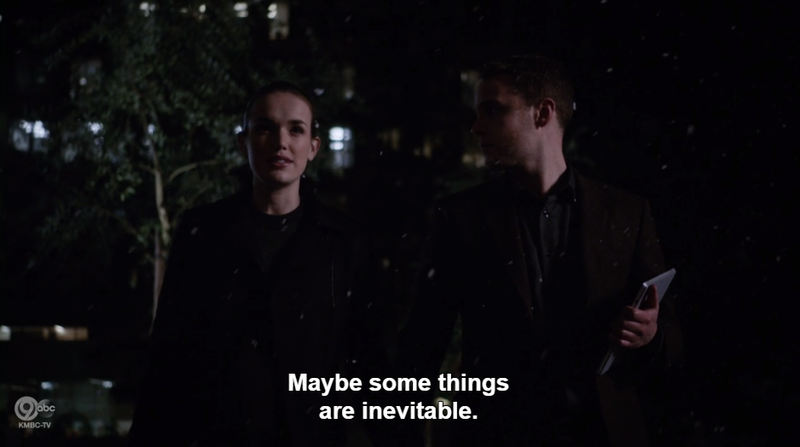 Daisy thinks she has all the answers because of what she’s seen, but as a single person she can only see so much: She doesn’t know Coulson is shooting a mirror, or that the snow is actually ash, or that the death she envisioned was her own instead of Charles’s. Having her be frequently wrong here—and needing to be helped by others along the way—is vital for her character, and will hopefully help her realize the limitations of her own power and the importance of working together with the people she trusts. Confidence is good; arrogance is dangerous. Daisy’s been treading the line between the two as of late. I’ll be curious to see if her experiences this week change her outlook in the coming ones, reminding her that SHIELD works best as a team and that, while she’s certainly smart and strong and a vital member of that team, she’s also just as fallible as the next (In)human. Like you two being adorbs, you mean? AoS isn’t really a show you watch for striking cinematography or visuals, but book-ending the episode with the robin carving was a nice bit of imagery. It’s the same bird but with much more significance by the end of the episode, showing how seemingly “static” things can change dramatically depending on one’s perception/understanding of them. Coulson calling Daisy “Skye” again for the first time in weeks was surprising and a bit aggravating, but he only does it when he’s freaking out for her safety and starts to think of her as the daughter-figure he met almost three years ago instead of the skilled SHIELD agent she’s become. People tend to slip into familiar, “muscle memory”-type habits when their adrenaline is up, and I think that’s what we’re seeing here. “I, uh … never saw the original Terminator.” “You’re off the team.” Phil and Lincoln make a surprisingly fun banterin’ pair. From now on I’m calling him NeoWard. Every time I see Brett on the screen, doing something weird, I laugh. I laugh so much. I know that isn’t the point, but it still happens. Unless it’s something gross. Then I wonder how gross it was for Brett. He always seems to be having a ridiculously good time being super freaking evil.